HTSA's structure is outlined in our constitution, which is based on the Supporters Direct devised 'Model Rules For a Supporters Community Mutual' document (2014). Below are the current directors of HTSA. During a thirty year teaching career Trev/Chopper specialised in PE, DofE, IT and Behaviour Management (not his!). He now spends his spare time, when not on HTSA business, driving buses around West Yorkshire. An opportunity, in 2008, to write the match-day notes for HTSA led to him eventually joining the Board where he held the role of Travel Organiser and Secretary before being elected as Chair in November 2016. Nomadic with a non-conformist outlook, his season ticket in the Kilner Bank has curtailed any stand-hopping for the time being. Emily is a recent graduate of Politics from the University of Huddersfield and currently works as an Account Executive. She has been following Town home and away since she was a child, and currently has a season ticket in the Kilner Bank stand. Emily was co-opted to the HTSA Board in March 2017, and became Co-Chair at the 9th AGM. James is a freelance writer. He went to his first Town game way back in 1994 and currently has a season ticket in the South Stand. James first came across HTSA through his work on the Huddersfield Town Heritage Project. He was co-opted to the Board in late 2015, before being elected as General Secretary in November 2016. Paul works in the digital world as a software developer for a major UK airline and package holiday provider. 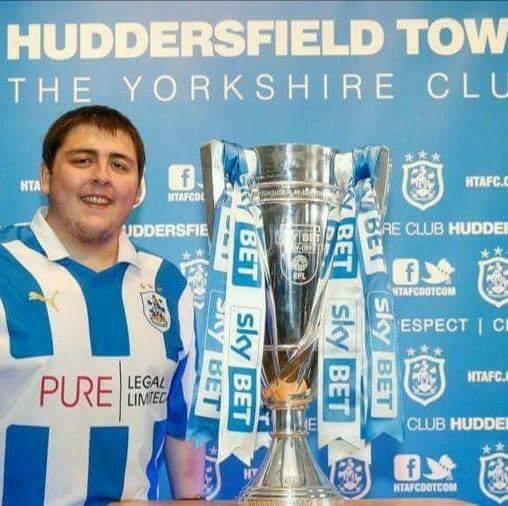 He first experienced a Town match in 2006 only to see Huddersfield lose 3-1 to Barnsley in the League One playoff semi-final. He is currently a season ticket holder in the South Stand. Paul started working with HTSA in late 2016 after being co-opted to the board at HTSA’s 7th AGM. He was elected as digital manager at the 9th AGM. Alasdair works as a supply chain analyst for one of the nation’s biggest supermarkets. His first encounter with the mighty Terriers was the F.A. Cup game against Liverpool in 1999. He is a season ticket holder in the South Stand. Alasdair was co-opted to the Board in November 2016 and was elected to the board as Treasurer at the 9th AGM. Stephen Booth has been a Town supporter since 1970, his first match being v Chelsea in the old First Division. He has been a season ticket holder ever since and visited well over 100 grounds around the country with the Terriers. Stephen was a founder board member of the original Survival Trust and was chair of the Fund Raising Committee during the dark days of administration. He now has a special interest in the heritage project. Steven graduated from Huddersfield University with a 2:1 in sports journalism and is currently trying to make his way to the top of the journalism industry. He has been a season ticket holder since 2009. Steven was elected to the Board at the 9th AGM in October 2017 as Disability Officer.